WHEN SUPERSTAR RAJINIKANTH FILLED MGR'S BOOTS..
Baasha will always be among the biggest blockbuster hits in Superstar Rajinikanth’s illustrious career. Baasha hit the screens for Pongal 1995 along with Kamal Haasan’s Sathi Leelavathi and many more notable films, all releasing on the same 15th of January. But if there is one film from the list that still gives goosebumps even if you watch it 21 years after its release, it would be Baasha. 1. Baasha was instigated based on discarded scene from Rajini’s Hindi film Hum. 2. Sources say that apparently the core story of Baasha was actually designed for MGR but since that did not materialize the veteran producer RM Veerappan decided to tweak the story a bit for Rajinikanth. 3. 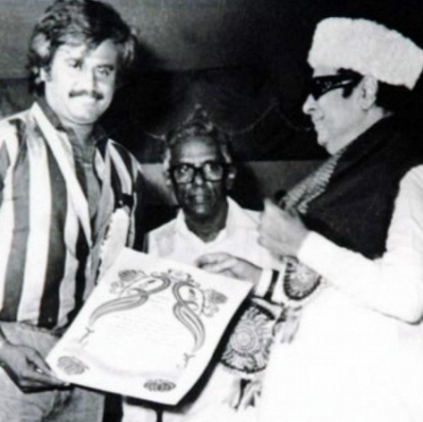 RM Veerapan reportedly did not like the idea of Rajinikanth being bashed up by Anand Raj in one of the scenes as he felt, like MGR, people might not like Rajinikanth getting beaten up. But Rajinikanth and Suresh Krishna convinced RMV saying it will be ok. It was one of the reasons to add rain effects for that scene which made it look as if the rain gods were against the brutal act against the Superstar. 4. Singer KJ Yesudas who turned 76 a couple of day back has last sung the number ‘Thanga Magan Indru’ for a Rajinikanth film under the composition of Deva. 5. Baasha was apparently the first Tamil film to run 50 days in 72 screens in Tamil Nadu, a whopping number of screens considering the size of the screens and market back then. Baasha is still one of the sought after movies whenever it is being aired in Television channels. Will we ever have another Baasha? People looking for online information on Basha, Rajinikanth, Superstar will find this news story useful.